The trial of former Catalan leaders for their roles in the failed independence referendum of 2017 began on Tuesday. A dozen people who helped lead Catalonia's failed secession bid more than a year ago entered the Supreme Court in Madrid on Tuesday to face charges including rebellion, criminal organization and the misappropriation of public funds — holding Spain in the grips of a highly politicized televised trial. The defendants, mainly former regional politicians, entered the courtroom while outside and across the country both pro-Spain and pro-independence protesters gathered under heavy police watch. The highest-profile defendant is former Catalan Vice President Oriol Junqueras, who is facing a sentence of 25 years. Others face lesser sentences, all stemming from what became a constitutional crisis: the Oct. 1, 2017, referendum in which voters declared independence from Spain by an overwhelming majority. (Most Spain supporters boycotted the vote.) Madrid, which had deemed the vote illegal, stepped in, dissolving the Catalan Parliament and imposing direct rule on what had been a semi-autonomous region. Madrid called new elections in December, and Catalans again voted for pro-independence parties. Several Catalan leaders scattered under the threat of imprisonment. Among those living in exile is former Catalan President Carles Puigdemont, who is refusing to return from Brussels and face trial. Of the separatists on trial in Madrid, some have been free on bail, but nine were deemed flight risks and have already spent months behind bars, including Junqueras. His lawyer Andreu Van den Eynde spoke in court Tuesday, casting the case as a question of freedom of expression and the right to vote, according to a translation from The New York Times. "We will not make a political defense, but we will defend human values and rights," Van den Eynde said, adding that thus far for the defendants, "every constitutional right has been restricted." "I am going with my high head, convinced that self-determination is not a crime," tweeted Jordi Sànchez, another defendant who is the former leader of the Catalan National Assembly. But standing outside the courtroom Tuesday, Iván Espinosa, of the far-right political party Vox, said the case centers not on self-determination but on a referendum that was an "attempted coup d'état against Spain led by a few separatist politicians who ... committed very serious crimes." Vox is helping prosecute the case. 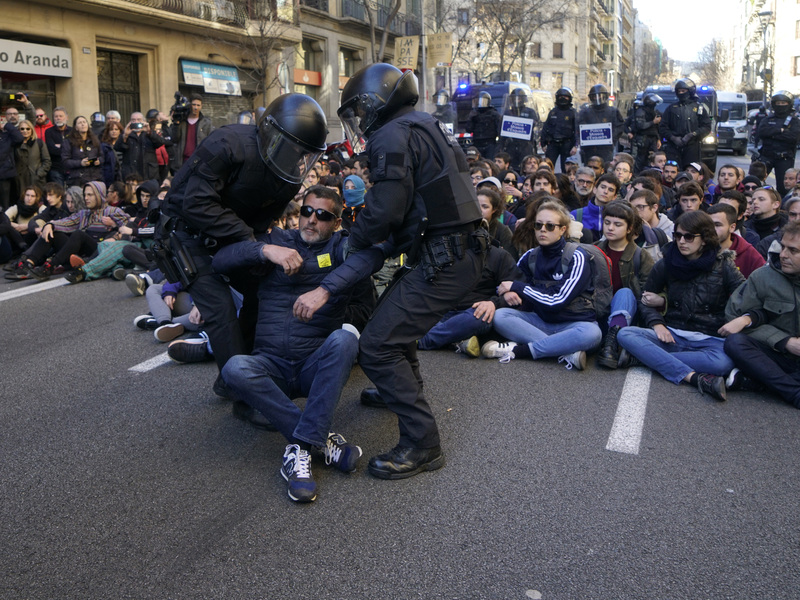 Pro-independence demonstrators are removed by Catalan police officers during a sit-down protest outside the Barcelona office of the state prosecutor on Tuesday. Espinosa said Vox is not acting in defense of party interests but rather in defense of "public order in Spain given the inaction of our governments, state institutions and other political parties." Prime Minister Pedro Sánchez, who came to power after the referendum, is treading a thin line. His national budget bill is up for a parliamentary vote on Wednesday and very likely needs the backing of Catalan pro-independence parties. But Sánchez has resisted calls for another independence referendum, risking the support of the separatists. If Sánchez's budget bill fails, his socialist government could also be in jeopardy. United Spain demonstrators gathered en masse in Madrid over the weekend calling for Sánchez's removal from office, saying he has been too lenient with Catalan separatists in signaling his openness to talks. "We work for a Catalonia in coexistence with a united Spain," Sánchez tweeted Tuesday. ⬛️⬜️📷 L’Assemblea també s'ha afegit a l’aturada de les 12 h davant dels centres de treball. 👉 A la tarda, concentracions arreu del país. Consulta la convocatòria de la teva territorial! 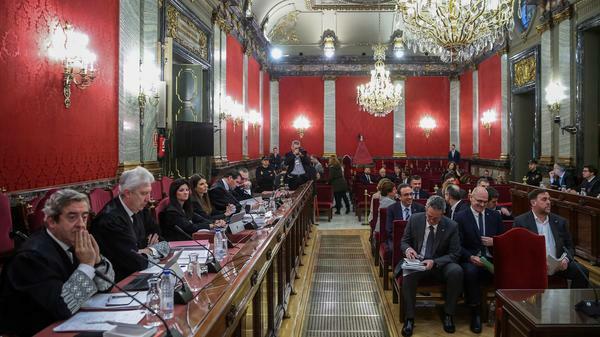 The Catalan National Assembly called for work stoppages on Tuesday to protest the trial. Some demonstrators held signs or linked arms and blocked traffic in Barcelona. Armed with their own language and culture, Catalans have long nourished a fierce pride. Opposition to Spain also centers on what some Catalans say are their outsize tax dollars siphoned by Madrid. Tourist-heavy Barcelona serves as the capital of the northwest region, Spain's wealthiest. The trial in Madrid is slated to last several months, with the verdict open to appeal.